How much door is "too much door"? 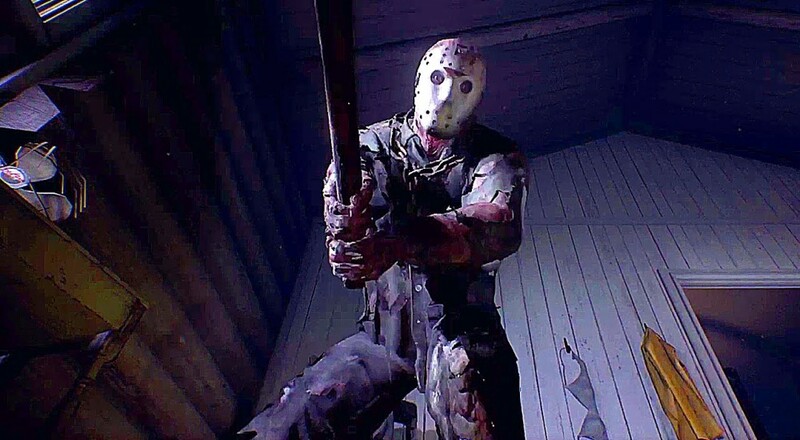 Jason Voorhees tops the charts on kill counts as far as major horror villains are concerned. This guy's been skewering/bludgeoning/tearing the limbs off of naked, defenseless campers for a couple of decades now, so he's got way more blood on his hands than your typical "monster of the week." Perhaps that's why a co-op survival horror game based on Friday the 13th, makes sense over, say, a Jeepers Creepers game. Jason won't start to have an existential breakdown no matter how many campers you throw at him. Nope! He'll keep carving into those screaming, amoral teens without question! PAX East was this week, bringing with it a pair of new gameplay trailers from Friday the 13th, both of which introduce pleading females meeting some grizzly ends. I'm not really sure what they're showcasing in this first trailer. Maybe it's a metaphor for attempting to escape death and your inevitable end? Perhaps it represents the futility of existence? More than likely it's just proving that Jason is a complete jackass who will find you and murder you because that's what he does. I wonder if this will have Oculus support. Actually, you know what, forget I said anything. I don't want to come face to face with Jason's fetid hockey mask. This next trailer highlights some of the beautiful scenery expected at Camp Crystal Lake. Campers will have previously enjoyed the rustic comforts of a simpler life away from their hectic modern day troubles. Oh, and you can watch in shocked horror as a seven foot tall sociopath obliterate's your camp mate's skull. Have you ever stayed in a camp cabin before? Those creaky wooden doors are made of the lightest material possible. I imagine the frame would shatter before her skull would, but hey! Video game physics! Friday the 13th doesn't have a release date as of yet, but I'm looking forward to hearing my friends squealing in terror, as I hide safely in a locked chest thirty miles outside of camp. Page created in 0.4113 seconds.